Who wouldn’t want to play a Sea Witch? With eels, no less? I’ve been fortunate to have had a long and rewarding career in musical theatre. I’ve done Broadway, a National Tour and countless regional theatre productions. I’ve appeared in world premieres, revivals and revisals, in roles dizzying in variety. In 2014 alone, I played an aging stripper, a Jewish mother, an amoral British money-lender and the mother of artist Georges Seurat. But there’s one kind of role that’s always eluded me: a shrieking, mugging, scenery-devouring, terrifying-funny psychotic. I’m talking, of course, about playing a Disney villain. More specifically, a villainess – since the few major Disney bad guys pale in comparison to their female counterparts. Since the role is such a plum, naturally many of my fellow actresses were interested in it as well, but I was shameless in letting the good folks at Olney know that I really, really, REALLYREALLY (really!) wanted to be seen for the role. To their credit, they did not shy back in horror at my eagerness, and when auditions rolled around I was called in to read. As it turned out, shameless was exactly what director Mark Waldrop was looking for. To my delight, I was offered the role, and accepted with greedy alacrity. 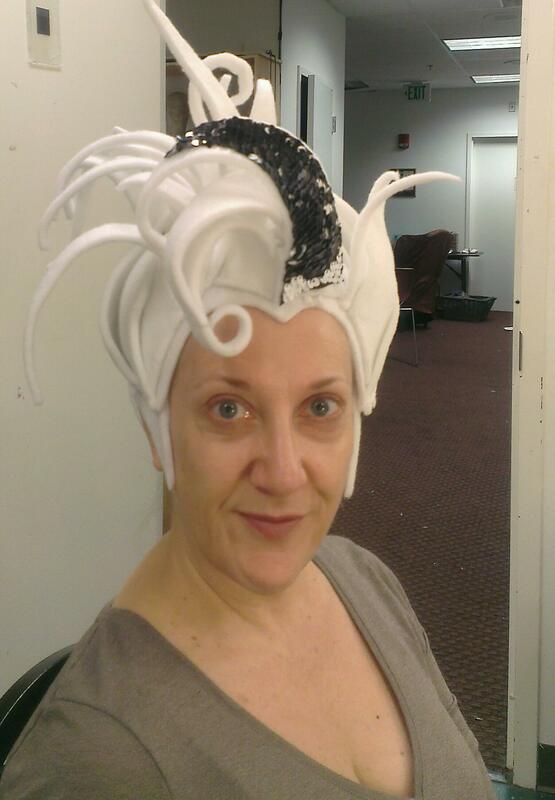 Becoming Ursula, though, was going to take more than just me being eager. 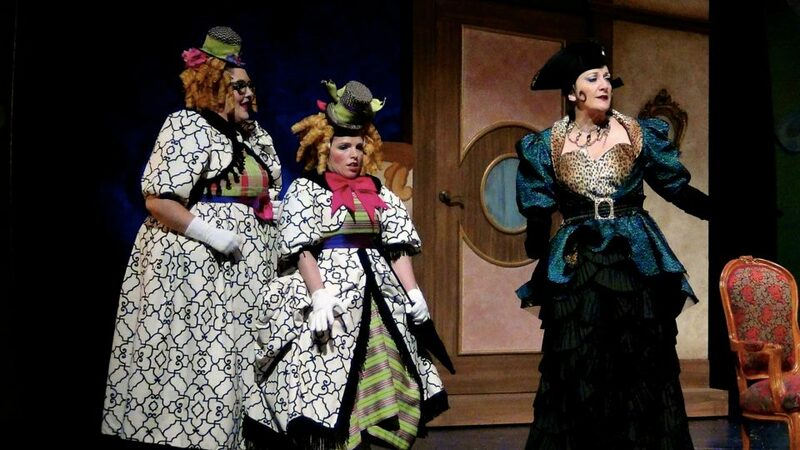 The Sea Witch is a grand creation: part human and part octopus, she’s an undersea nightmare that has to be translated from the anything’s-possible world of animation to a flesh-and-blood actress treading the all-too-solid boards of a theatrical stage. It’s a major challenge, but when I discovered that Pei Lee was going to be designing the costumes for Olney’s production, I knew I was in good hands. Pei and I have worked together in the past (that’s some of her work on Olney’s 2012 production of Cinderella to the left) and I’m a huge admirer of her creativity and attention to detail. 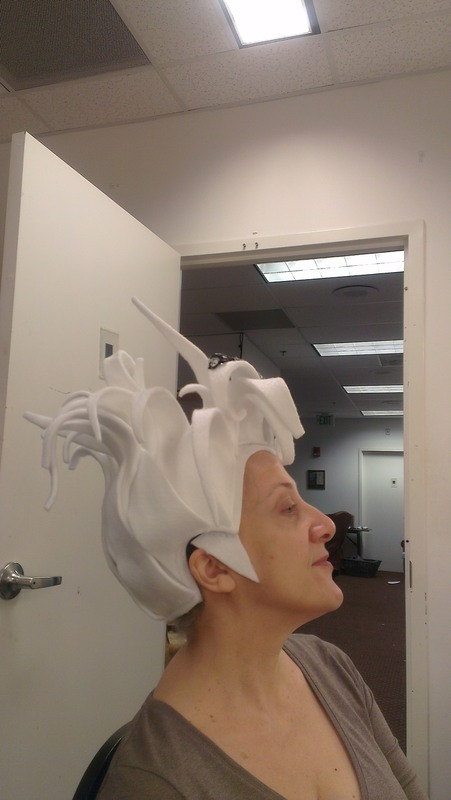 Ursula’s headdress, a work in progress. A noble profile, in the making. 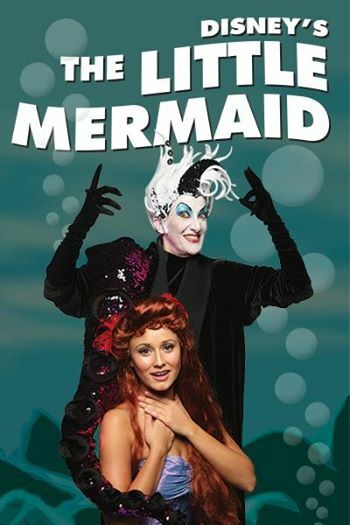 Because Olney’s PR department wanted to do a publicity photo shoot in October, Pei got in touch with me in late July to start work on the Ursula costume, specifically on the character’s headdress, which would be featured in the photos. We met so she could make a wrap of my head (a complicated process involving plastic wrap, scissors, felt-tip markers and a LOT of tape), and approximately a month later I went out to Olney for a fitting. Even unfinished, the headdress was amazing. It had the shape and flow of Ursula’s hair from the animated feature because it’s made of a lightweight fabric called FossShape (which can be sewn and then “frozen” into place using heat). It fit like a dream and was even comfortable. Pei had included details like reversible sequins (which can be shifted from white to black) and during the fitting, roughed in “sideburns” to complete the look. We were both tremendously pleased with the results. 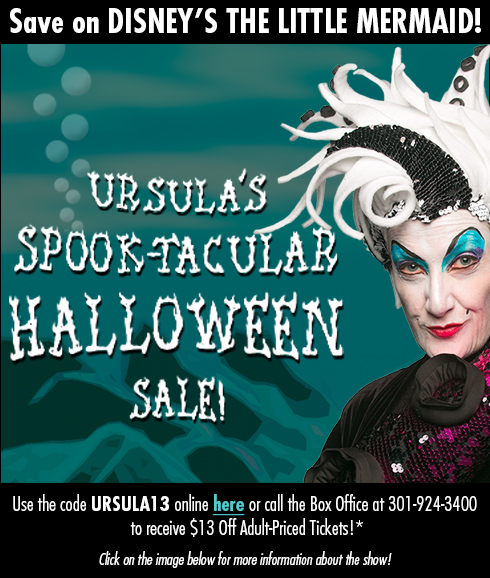 Halloween $13-off ticket promo ad. Since the photo shoot was going to focus on head and shoulders, we also had to do a makeup trial. The day of the shoot I came in early, and we played with both water and creme-based makeups for about an hour. 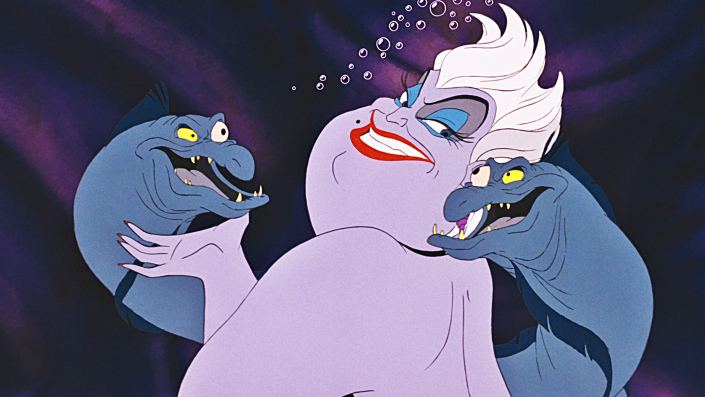 Rather than the purple-skinned Ursula of the cartoon, Pei wanted a paler version with just some gray-lilac shading beneath the cheekbones, with teal, black and purple around the eyes and bright red lips. While we liked the translucency of the water-based makeup, applying it with a makeup sponge was tricky and the results somewhat uneven and streaky. 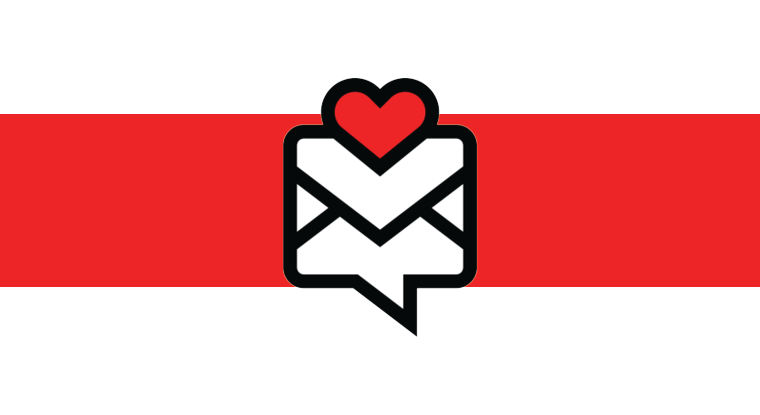 Since the photos would be edited and the publicity team, along with our Ariel, Laura Zinn, were waiting, we decided we’d revisit the makeup issue down the road. I got into the now-completed headdress, a rough mockup of the Ursula costume (which was far from ready) and we did the shoot. The photos turned out great. In front of the green screen. 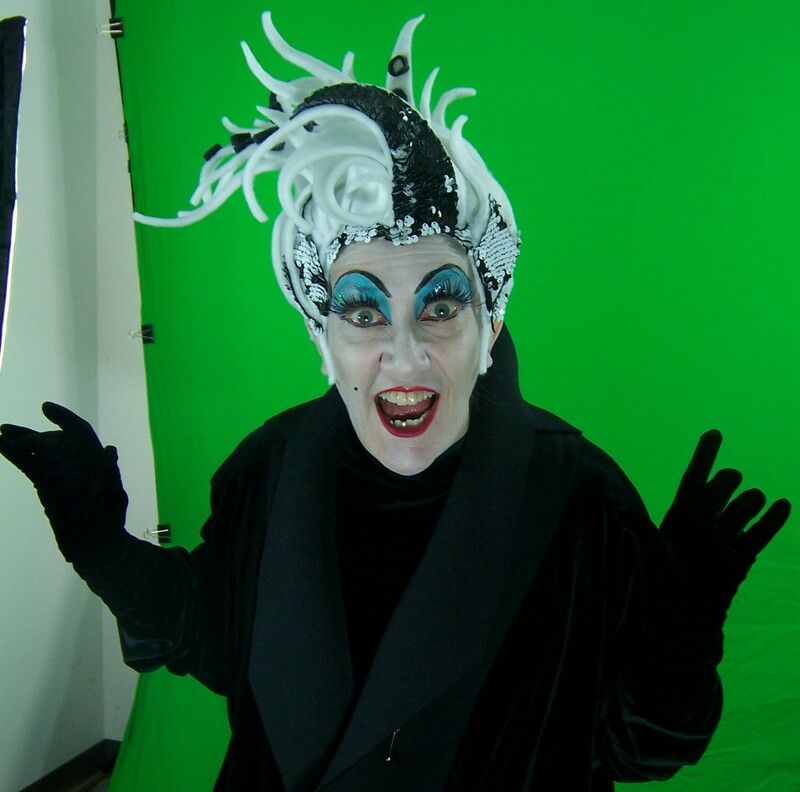 Our second makeup trial happened during the third week of rehearsal, when we needed to shoot a green-screen video for a special-effects moment which occurs late in the second act. The costume was still being built, so the rough mockup was called into play again. For the makeup, we had a little more detail this time, including some whacked-out tinsel false eyelashes I happened to have in my kit. However, we still weren’t happy with the streaky results of the water-based foundation, but didn’t want to sacrifice its translucence for a smoother but opaque creme-based makeup. (We also decided that the lashes, while fun for the video shoot, were a bit too pale and fragile for eight shows a week.) After the video shoot, I scrubbed my face and went to rehearsal. While talking over the shoot with fellow cast members, I mentioned the makeup issues and our dissatisfaction with the streaky application. One of our Mersisters (Gracie Jones, who plays Andrina) looked thoughtful. 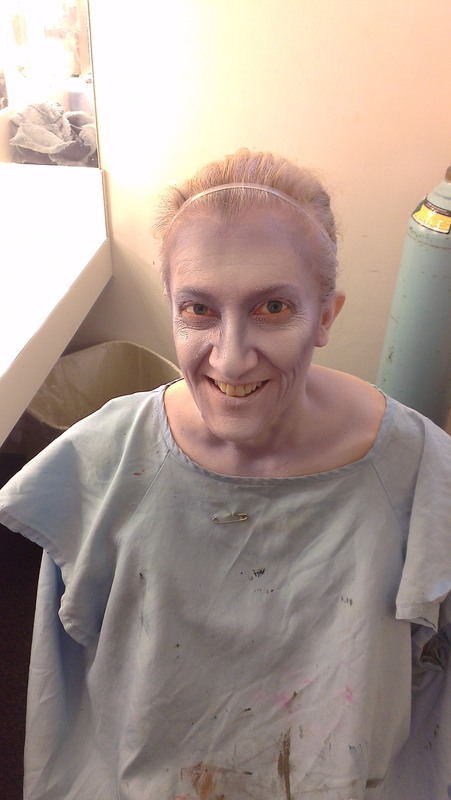 “Why don’t you try airbrushing?” she asked, and on being quizzed further, showed me photos of airbrushed zombie/ghoul/ghost makeup designs she was currently producing for Markoff’s Haunted Forest in Dickerson, MD. (Great article about the Forest here, if you’d like to know more.) “I’d be happy to do your makeup,” Gracie added. Well, you can bet I pounced on that offer. 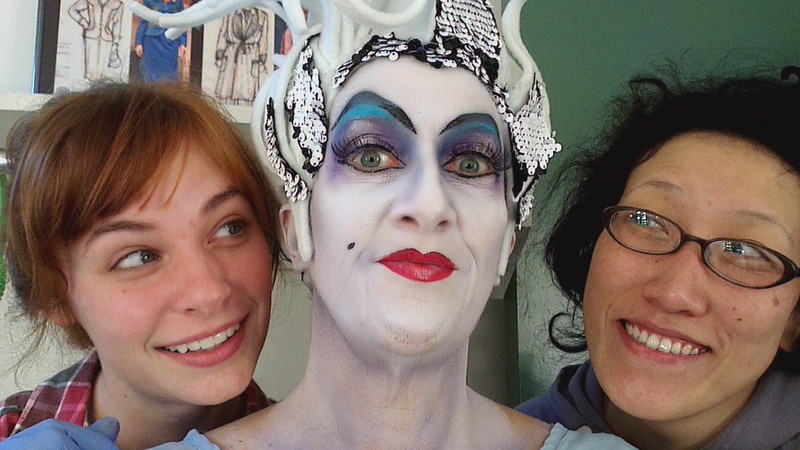 I texted Pei, and 48 hours later we were into Ursula Makeup Trial #3. Pei, Gracie and I (well, Pei and Gracie – I just sat there) experimented with the airbrush technique for a good hour. The application process was super-smooth and even, and took half the time of the previous sponged-on trial. Our first version ended up looking a little too ghoulish, so I washed off and we started again. This time I pincurled my hair, as Pei wanted to see the finished makeup with the headdress. Success! And in half the time! With a little lighter hand on the shading, Gracie was able to produce the results Pei wanted. 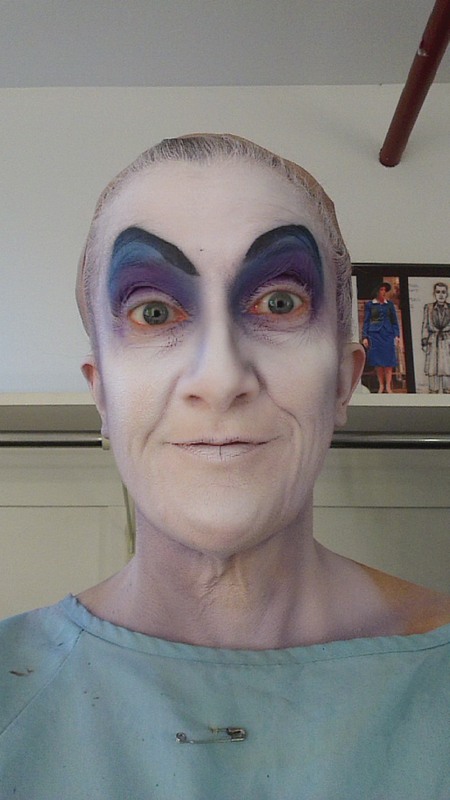 She was also able to lay down a base of teal and purple for the eyeshadow, and using a template of Pei’s design, even swooshed in Ursula’s wildly arched eyebrows. The smoothness of the application, not to mention the time saved, was cause for celebration. With Gracie’s work done, she cleaned up while I added the fine details (yes, I actually did something more than just sit there the whole time). I finessed the brows, applied a thick, sturdy set of lashes, lined my eyes a la The Black Swan, gave myself a full cupid’s-bow mouth in bright red, and for the finishing touch, added Ursula’s signature beauty mark. Pei brought in the headdress, we popped it on and voila! URSULA! To say we were three happy campers would be the understatement of the year. 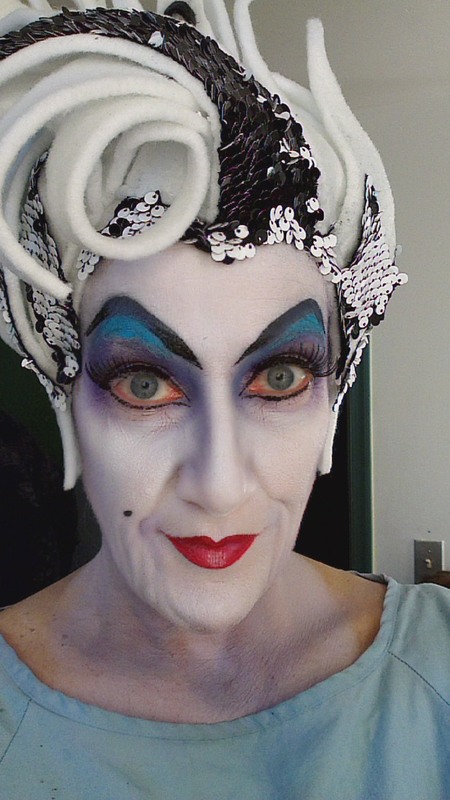 At last Ursula’s face was in place! Up next: Tentacles, et al. The finished Ursula and her creators: Gracie Jones, me and Pei Lee. Wow wow wow fellas, look at the Grande Dame now fellas! Woo Hoo!!! Lovely, I’m so glad you’re doing this as Evil Glamorous!